A colony of bats and other wildlife that call the 3 hectare bushland near the Equine Precinct at Bundall on the Gold Coast home, will soon be evicted. The bushland will be cleared due to a perceived risk of Hendra Virus being passed from the bats to horses. But some believe this action will result in displaced and stressed bats being pushed into nearby backyards. If protracted it could become a major management headache for Gold Coast City Council and be responsible for the deaths of protected native flying-foxes when they are already suffering national population decline through habitat loss and climatic uncertainty. Bat Conservation & Rescue Qld president, Louise Saunders said, “The removal of vegetation and the dispersal of up to 2,000 flying-foxes, including the vulnerable Grey-headed Flying-fox is extremely concerning. Like most urban dispersals elsewhere, the action at Bundall could be a costly and ongoing problem for Council. It is likely that flying-foxes could end up in locations that are more difficult to manage, such as nearby residential backyards or in local colonies that are already causing conflict with residents,” Ms Saunders said. “We are concerned that the public may get the wrong idea from this dispersal and misinterpret the health risk to humans. Humans cannot get Hendra virus directly from flying-foxes. Sadly, all human cases have been contracted from contact with horses. The method of transmission from bat to horse is still inconclusive”, Louise said. “This is an extreme action against bats when there is such a slight health risk to horses. We were especially surprised that this action would be considered, as a cost effective vaccine to protect horses has been successful in recent trials and is so close to being available to horse owners”. We would like to remind people not to handle flying-foxes. Like any wild animal that is frightened or in pain it could bite or scratch. We have trained and vaccinated volunteers. If anyone finds an injured bat or bats in their backyard during the day, please call our help line on 0488 228 134 or call the RSPCA on 1300 ANIMAL. The vegetation removal and dispersal of flying-foxes is expected to take place within the next few weeks. Important information: Neither you, nor your pets, can catch diseases from having bats in your backyard or by living near a bat colony. Less than half of one percent of bats may have Australian Bat Lyssavirus, a preventable but potentially deadly disease. It can only be contracted from a deep bite or scratch from a bat. An effective vaccine is available. Our message is please don’t try to help an injured flying-fox, call for help. Any bat found alone through the day needs assistance. Please call for help as soon as possible. For further information call (07) 3821 2341 B/H only. 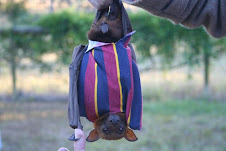 For rescue assistance call Bat Conservation & Rescue Qld’s rescue helpline on 0488 228 134. Visit our web site to find out more about these amazing mammals: www.bats.org.au Media release, Bat Conservation & Rescue Qld Inc.
A western Queensland family has been told it will have to wait for more than 10,000 flying foxes to finish breeding in their backyard before they can be moved. Barcaldine resident Brett Walsh estimates 12,000 little red flying foxes are living in his and his neighbour's backyards. He says they have been there for 14 weeks and nothing can be done because the females are having babies. Mr Walsh says he and his wife can barely use their garden but the Queensland Parks and Wildlife Service (QPWS) seems more concerned about the animals' welfare. "Basically just completely confined to your house," he said. "They have a fact sheet, 'Learning to live with Flying Foxes', and that seems to be the attitude." He says he and his wife are worried about the hendra virus and lyssavirus. "We don't have any horses but there are horses around the town and I'm not sure how that would affect those people," he said. "We are more concerned about the lyssavirus, which can spread direct from bats to humans. "That disease is fatal - we don't want to see any harm to the babies but we just want them gone." Mr Walsh says he and his wife even considered moving out of the home until the colony moved on. "There is a lot of bat faeces and urine, the smell - you can't do any activities in your yard like gardening or having a barbecue," he said. "Basically, you are completely confined to your house. "We don't want any harm to come to the animals but we want our lifestyle back and our house back." The QPWS says flying foxes are an important part of the ecosystem. QPWS spokesman Michael Devery says it is a matter of waiting until the young are independent before dispersal options can be considered. "If you've got young there and the mothers are dispersed, for example, then the young will just starve to death," he said. "At this point in time it has to go through that cycle of the young being able to be independent and then the animals will move on. "Little reds are nomadic, they don't stay. "There is no doubt there is an imposition [but] these animals will finish breeding and they will leave the property."